Here is a comprehensive collection of lists, forms, and resources that you will use on a daily basis when working with children or adults with communication disorders. You also receive suggestions for integrating language development activities into the reading curriculum, suggestions for helping children apply what they know about language to the learning of reading, strategies for working with bilingual/multicultural populations, information about African American English, articulation and language differences, and more. Language differences resulting from the influence of Spanish.......AND MORE! Suggested bookstore price is $49.00. 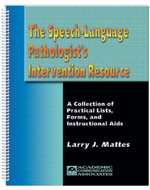 Save $5.00 by ordering the Speech-Language Pathologists Intervention Resource direct from us.